One of the greatest compliments I ever received with regards to reviewing, although the person who gave it may not have intended it to be complimentary, was when someone fed back that a review they had read had felt as though I had just walked in off the street without knowing anything about the production and gave an analysis based on what I had seen. It’s a litmus test of sorts for me – imagine not being familiar with the material of a show before seeing a production of it. How would that production be received? Could it be understood by a friend or family member without them having done ‘homework’ beforehand? I didn’t have to imagine being a first-timer to The Pass. A small-scale production, it’s a world premiere nonetheless, and there’s nothing wrong with testing the waters before adjusting, making amendments and rolling the show out on a larger scale. At least I think that’s the idea. Mind you, the conversational living room ambience created by Denise Marsa as she tells her life story suits the studio theatre spaces better than the larger proscenium arch stages would. The songs featured in the show are all Marsa’s, and they are more evocative than provocative. Maybe, just maybe, there was a missed opportunity to sell merchandise. The quality of the music is such that I may have considered buying an album recording if one were available to purchase at the theatre. Okay, it may be what (almost) everyone else does at their own show, and perhaps many of Marsa’s fans will already have all her records. It’s all about, as the programme tells the audience, ‘songs and vignettes’, and as all the material is Marsa’s own, it all fits like a glove. A few still images are projected at the appropriate moments, saving the time and effort involved in laborious descriptions. The first half seemed, at least to me, to be skilled and tuneful enough but more than a tad reserved, though patience is rewarded after the interval as the best stories are saved for last. And why not? The reverse would have been anticlimactic to say the least. Analysis can be sparing during the show – for example, when a potential record deal with a major record label falls through, it would have been interesting to have found out the reasons why certain personnel key to making things happen left the record label when they did. The first-person narrative, by nature, leaves little if any room for alternative perspectives that may differ from the storyteller’s own. That said, the story itself contains more setbacks than successes, and Marsa thrives best when strikes out on her own, professionally speaking. As for the personal, “I struggle to be in a relationship, and I struggle to be alone”, she muses. Marsa has a number of pages of notes on stage to guide her along. Some may argue that one ought to know one’s own story off by heart. But I don’t find memory aids a problem in the slightest: I started to read an autobiography on the Tube home, in which the author dismisses people who recall in vivid detail relatively mundane events from decades ago, asserting, slightly tongue-in-cheek, that unless they have photographic memories, they must have made very thorough diary entries the same day as when the events in question took place. As for significant events, well, that’s different. So, as far as the show goes, it’s telling, for instance, that Marsa had no need to glance at a crib sheet when recalling a crime against the person. Marsa has a warm and inviting singing voice. The evening proved educational as well as inspirational for this reviewer – there was so much about Denise Marsa beyond ‘Lucky Stars’, the song she duetted with Dean Friedman in the late Seventies. But whatever your level of familiarity with Marsa, her life and her career, it’s good to be reminded of the importance of keeping everything in perspective. A nuanced and fascinating show. 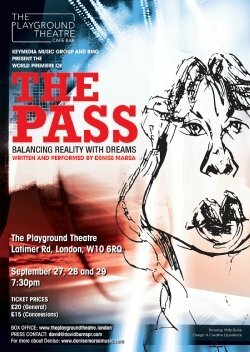 THE PASS is a one-woman show that mingles vignettes with Marsa’s original songs written over the past four decades. With true tales of hit records, publishing deals with Warner Bros. Music and Warner/Chappell, a record deal with a label run by a 21 year-old French billionaire’s son, and Marsa’s own personal highly guarded secrets, the show focuses on Marsa’s development as a musician, artist, and individual struggling with relationships and solitude. Filled with humour and honesty, it centres on the concept of being true to your own definition of success, no matter what the consequences. Marsa is currently signed as a songwriter to BMG, the new music company. Whatever happened to the other singer on Lucky Stars?